The development of Islamic finance in Malaysia has been supported by firmly established financial institutional structures and a robust regulatory framework. Shariah audit function provides independent assessment & objective assurance designed to value-add & improve IFI’s compliance with Shariah. This function is key in the overall Shariah governance framework to instil confidence among the stakeholders. 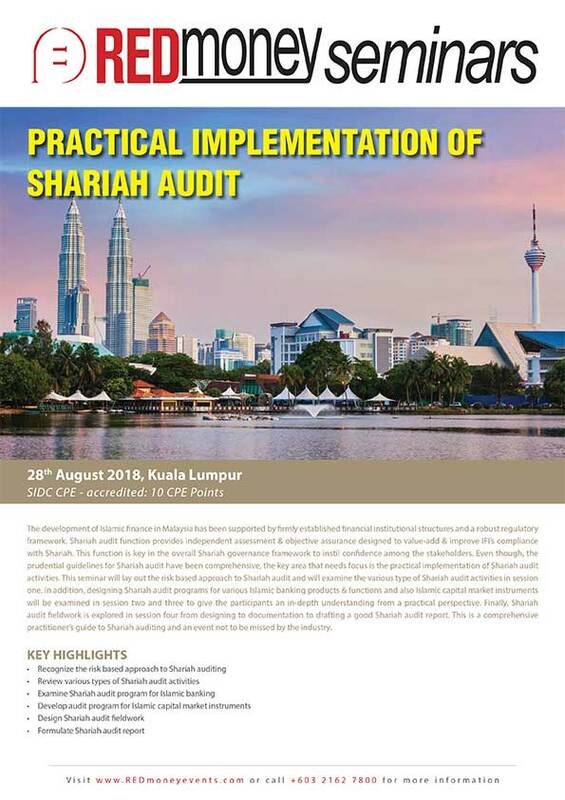 Even though, the prudential guidelines for Shariah audit have been comprehensive, the key area that needs focus is the practical implementation of Shariah audit activities. This seminar will lay out the risk based approach to Shariah audit and will examine the various type of Shariah audit activities in session one. In addition, designing Shariah audit programs for various Islamic banking products & functions and also Islamic capital market instruments will be examined in session two and three to give the participants an in-depth understanding from a practical perspective. Finally, Shariah audit fieldwork is explored in session four from designing to documentation to drafting a good Shariah audit report. This is a comprehensive practitioner’s guide to Shariah auditing and an event not to be missed by the industry.